Installation of SilverGlo®, TerraBlock™, or CleanSpace® Drainage Matting as required for enhanced moisture and vapor retardation. Out of sight, out of mind. But out of sight doesn’t necessarily mean that excess moisture and poor air quality in your crawl space isn’t hurting you. Excess moisture supports the growth of mold, dust mites, insects, and other pests. It also may cause structural damage to your home’s wood framing and degrades some forms of insulation, fiberglass in particular. Poor quality air and allergens caused from mold spores and dust mite droppings (the two largest indoor allergens) can affect some people’s health. Wrong. Up to 40 percent of the air we breathe on the first floor of our homes comes from the crawl space or basement! 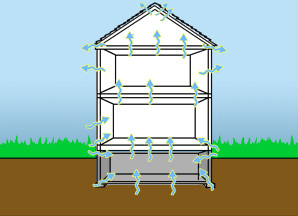 This air gets into the first floor because of what’s called the stack effect (think of a chimney). Warm air in the upper levels of a home rises and is expelled, typically through the attic. But nature abhors a vacuum, so that air that’s expelled must be replenished. The source? Some of it comes in through windows and doors but much of it is sucked up from the crawl space or basement. A crawl space vapor barrier can stop hundreds of gallons of ground water per year from finding its way into your home and damaging it. A CleanSpace® barrier blocks moisture from evaporating into the crawl space, keeping it dry and reducing heat loss. 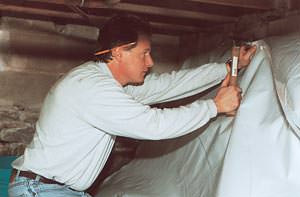 A vapor barrier slows or prevents the evaporation of ground moisture into the crawl space air. If coupled with a waterproofing system, moisture and water can be expelled from the crawl space before it can cause problems. No more rot, rust, mold, odors, insects or other moisture-related problems. A vapor barrier, by its nature, resists the passage of air. By stopping air movement from the ground, it can also turn your crawlspace into a semi-conditioned space – one that is close to the temperature of the living spaces above. When that occurs, your floors feel warmer in winter and your energy bills go down. A vapor/air barrier can also slow or block most of the movement of harmful gases, such as radon, from the soil. Coupled with a radon mitigation system (in the event that radon is present in higher than acceptable levels), a vapor barrier can significantly reduce radon levels in the home. Ready to improve the state of your crawl space? Contact us for a free consultation about how to clean up, dry up and seal up your crawl space for good. 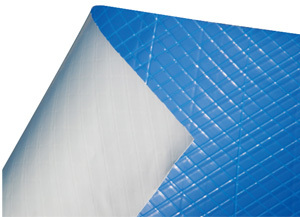 CleanSpace® 20 mil vapor barrier is puncture and tear resistant. An anti-microbial agent is blended into the liner to kill mold and bacteria. For a vapor barrier to be effective in the long term, it must be durable. That’s why Basement Systems developed the CleanSpace® crawl space liner. Made of a 20-mil 7-ply sandwich of high and low-density polyethylene with polyester-cord reinforcement, the liner is treated with an antimicrobial finish that protects against mold and mildew growth on or under the CleanSpace® liner. There are also 10 mil and 12 mil vapor barrier options for certain applications. The CleanSpace® liner significantly outperforms thin and easy-to-tear 6-mil liners that are commonly used as vapor barriers. The CleanSpace® liner is also UV resistant as opposed to 6-mil liners that typically crumble and disintegrate in a short period of time. Looking to have a vapor barrier installed in your crawl space? Your local Basement Systems or CleanSpace® dealer can professionally install the CleanSpace® vapor barrier in no time - eliminating mold growth and all those bad odors entering your home!